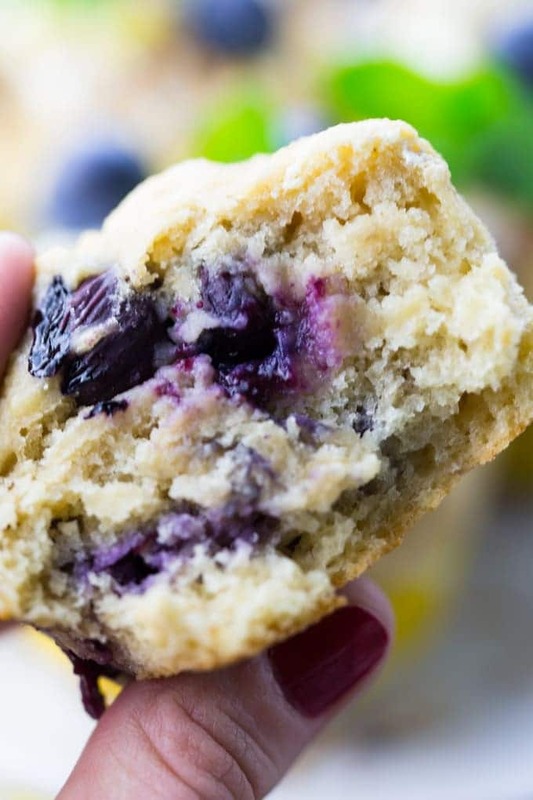 The recipe for these vegan blueberry muffins couldn’t be easier. They’re ready in only 25 minutes and all you need for the preparation is one bowl! And they’re so delicious and moist. The perfect little treat! I LOVE making muffins because it’s just so easy! I mean I love baking in general, but my favorites are definitely muffins. I’ve always had a weakness for moist and perfectly sweet muffins. And this didn’t change when I became vegan. These vegan blueberry muffins are one of my favorite vegan muffins! What Do You Need To Make Vegan Blueberry Muffins? The ingredient list for these vegan blueberry muffins is pretty short! As always you can find the full ingredient list in a separate recipe box at the end of this post. How Do You Make Vegan Muffins? How Do You Replace Eggs and Milk? Making vegan muffins really isn’t more complicated than making regular muffins with eggs. Instead of eggs you can just use flaxseeds, mashed bananas, or apple sauce. They’re all a great, easy, and very cheap egg replacer. My favorite are vegan muffins with banana. SO easy! You can even veganize old muffin recipes this way. Replacing milk is even easier than replacing eggs. Just use plant-based milk alternatives instead such as almond milk, soy milk, or oat milk. I posted a little guide to vegan baking some time ago and Peta also has some great tips. 1. STEP: In a medium bowl, combine all ingredients except the blueberries. Stir with a wooden spoon until well combined. 2. STEP: Add the blueberries and use a spatula or spoon to gently fold the blueberries into the muffin batter. 3. STEP: Place baking cups in a muffin pan and divide the mixture evenly. 4. STEP: Bake for about 20 minutes at 360°F. Let the muffins cool down for about half an hour. 5. STEP: Top the muffins with more soy yogurt, lemon zest, and blueberries if you want or just enjoy them by themselves. For the eggless blueberry muffins I used a mixture of all-purpose flour and almond flour. I love vegan muffins with almond flour because the almond flour makes them extra moist. If you can’t get hold of almond flour or if you’re allergic to almonds, you can of course just use regular flour instead. No problem at all! The other “secret ingredient” to make these vegan blueberry muffins extra moist is yogurt. I used vanilla-flavored soy yogurt, but plain yogurt is also fine. If you want, you could just add a teaspoon of natural vanilla extract in this case. We enjoyed the vegan blueberry muffins with some vegan yogurt and lemon zest on top. This is optional, but I highly recommend the combination of blueberries and lemon. If you want you could also add a bit of lemon juice or lemon zest to the muffin batter. The best way to store muffins is in an airtight container at room temperature. The trick is to line the container with paper towels. Then add the muffins and put another layer of paper towels on top of them. They will soak up the moisture and the muffins will stay delicious and fresh. This way the muffins will keep for 2 to 4 days. I do not recommend to store the muffins in the fridge as they will lose flavor this way. I hope you like these vegan blueberry muffins as much as we do around here. If you give them a try, I’d love to know what you think about them. Just leave me a comment and a star rating below. Your comments really make my day! The recipe for these vegan blueberry muffins couldn't be easier. They're ready in only 25 minutes and all you need for the preparation is one bowl! And they're so delicious and of course vegan. The perfect little treat! Simple and DELICIOUS!! In a medium bowl, combine all ingredients except the blueberries. Stir with a wooden spoon until well combined. Add the blueberries and use a spatula or spoon to gently fold the blueberries into the muffin batter. Place baking cups in a muffin pan and divide the mixture evenly. Bake for about 20 minutes at 360°F. Let the muffins cool down for about half an hour. Top with more soy yogurt, lemon zest, and blueberries if you want or just enjoy them by themselves. For the eggless blueberry muffins I used a mixture of all-purpose flour and almond flour. I love vegan muffins with almond flour because the almond flour makes them extra moist. If you can't get hold of almond flour or if you're allergic to almonds, you can of course just use regular flour instead. No problem at all! The other "secret ingredient" to make these vegan blueberry muffins extra moist is yogurt. I used vanilla-flavored soy yogurt, but plain soy or coconut yogurt is also fine. If you want you could just add a teaspoon of natural vanilla extract in this case. This almost look too pretty to eat! Just looking at these make me happy. So bright and cheerful. They scream summer and sunshine. Yum! I bet the tang of the soy yogurt makes them great! I love all of the flavors in this muffin! Looks delicious, Sina. Those are beau-t-ful! Perfectly fluffy! I recently tested a bunch of different egg replacers in blueberry muffins, and df yogurt won out, so I love that you used it here – I bet these are amazing. Could you use coconut sugar instead of brown sugar? And if so, would you have to tweet anything else? Sure! No problem. :-) I haven’t tried using coconut sugar for this recipe, but I’ve used it for many other recipes. So you should be fine. Hi these look fabulous, just wondering if you can freeze them? I’m wondering what I can use in place of the all-purpose flour? Instead of all-purpose flour, can we use white-whole wheat flour instead? They were so good! Thanks for the recipe, Sina! I used whole wheat flour instead of all-purpose flour and they turned out great. Loved the texture!